The purpose of this application note is to describe a method for heat sinking of Mini‐Circuits high‐power surface mount components to prevent overheating when operating at high power. 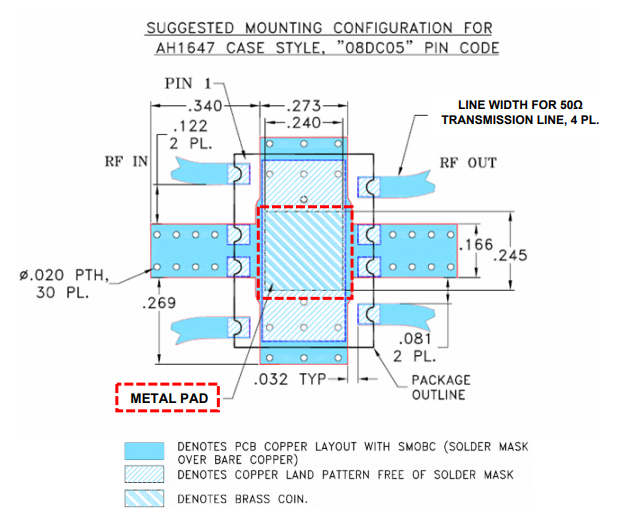 This application note applies to all Mini-Circuits surface mount components in case style AH1647. Mini-Circuits' high-power surface mount components packaged in case style AH1647 include models with specified maximum input power ratings up to 100W. However, proper heat sinking of these units is required when operating at high power to ensure adequate heat transfer from the ferrite core to ambient and limit temperature rise. Without proper heat sinking, the unit may overheat and separate from the PCB when operating at high power for long periods of time. Internally, a ferrite core is mounted on a metal pad which is securely attached to the PCB of the unit. Heat travels from the core to the metal pad and should be transferred to ambient to limit the rise in temperature. A suggested method to allow adequate heat transfer is shown in figure 1 with provisions to be made on the customer PCB. The customer PCB should be prepared with a rectangular hole measuring 0.24 x 0.245”, matching the dimensions of the metal pad in the unit as shown in the 98‐PL‐351 drawing reproduced in figure 2. A metal heat slug of this size should be fit into the hole in the customer PCB and attached to the bottom of the metal pad inside the unit case by soldering. This will allow proper transfer of heat from the core of the unit to ambient through the customer PCB. 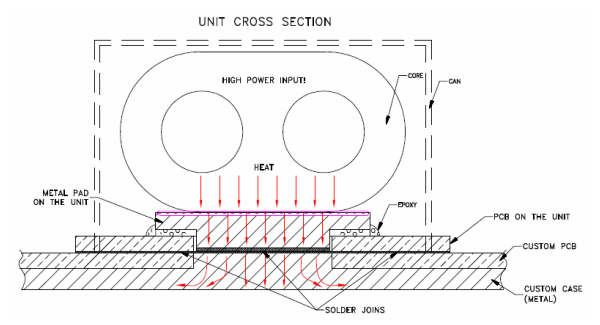 Figure 1: Suggested method for heat sinking through a heat slug in the customer PCB. Figure 2: Reproduced drawing 98-PL-351 denoting area of metal pad inside the unit case. Customer PCB should be outfitted with a hole of matching dimensions to accommodate a metal heat slug. To ensure Mini‐Circuits high‐power surface mount components achieve their rated maximum RF input power handling as specified in the model datasheet, units must be mounted to the customer PCB using a method for adequate heat sinking. The method described in this application note will ensure proper operation of the coupler at high power without overheating. If the customer PCB cannot accommodate a metal heat slug, then the customer should provide an array of thermal vias to limit temperature rise as much as possible, but heat transfer could be poor, and maximum input power handling may be lower than the specified rating as a result.